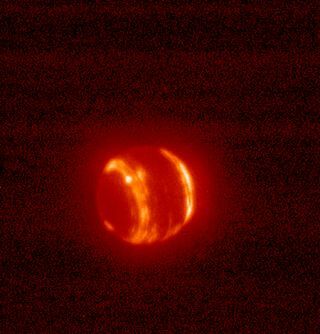 A shot of faraway Neptune in infrared light, captured using the adaptive optics system at Hawaii's Keck Observatory. The distant "ice giant" planets Uranus and Neptune look like worlds aflame in new photos captured by Hawaii's Keck Observatory. To the naked eye, Neptune would appear blue and Uranus bluish-green. But Caltech astronomer Mike Brown snapped the new pictures in infrared light, using Keck's adaptive optics system. So the two planets blaze reddish-orange, like embers glowing in the dark night of deep space. These streaks represent high-altitude clouds that are reflecting a lot of light. Neptune is a stormy place, hosting some of the most violent maelstroms in the solar system. This shot, taken in infrared light using the adaptive optics system at Hawaii's Keck Observatory, shows Neptune and its moon Triton (lower right). One image captures Neptune along with its largest moon, Triton, which is about 80 percent as big as Earth's moon. Brown studies objects in the frigid outer reaches of the solar system, both in the Kuiper Belt and beyond. He has discovered a number of dwarf planets way out there, including the Pluto-size Eris in 2005 — a find that spurred astronomers to rethink just what a planet is (and, ultimately, to demote Pluto to "dwarf planet" status in 2006). During the recent Keck observing session, Brown and his team were more interested in Triton than Neptune. "We were studying Triton at the time, trying to see if we could make a crude map of its surface composition," Brown told SPACE.com in an email. "But Neptune is a little too spectacular to not stop and take a picture of it as long as you're nearby." A view of Uranus in infrared light, captured by Hawaii's Keck Observatory. The moon Miranda is to the upper left of Uranus, and the moon Puck is a faint smudge to the upper right. The bright splotches on Uranus' disk are clouds. "The rings are faint and really tough to see and not even discovered until moderately recently, but Uranus is so dark at these wavelengths that the rings are quite easy to see," Brown said. One Uranus image shows several of the planet's 27 known moons, including one known as Miranda, which blazes bright above and to the left of Uranus. Despite being just one-seventh as big as Earth's moon, Miranda boasts canyons 12 times deeper than the Grand Canyon, as well as numerous other interesting geological features. Again, the moon drew Brown's attention more than the planet. "Here we were looking at Miranda, which is quite close to Uranus," Brown said. "But, again, we couldn't resist the photo opportunity." Also visible in the photo is another, fainter moon, Puck, to Uranus' upper right. The bright spots on the planet's disk are high clouds, Brown said.